A human and environmental tragedy that should never happen again | Fleming. At that time, the factory was owned by Union Carbide India Limited (UCIL), majority owned by UCC, with Indian Government–controlled banks and investors holding a 49.1 percent stake. After the tragedy, UCC negotiated a settlement with the government in 1989 for $470 million (around $300 to $500 per victim). The impact on the company was tremendous. Investors dumped shares, UCIL faced many lawsuits, and hostile takeover attempts led to the government taking control of the property in 1998. Later, in 2001, Dow Chemical Company bought the remains of UCIL – not only the company's assets but also its liabilities. And this is the problem that is keeping non–governmental organizations and journalists busy. It seems like a hot potato issue; no one wants to deal with it. And when they do, the public does not like the result. The official website of Union Carbide, now owned by Dow, states that the incident was the result of sabotage and that safety was sufficient (bhopal.com).Late in 1986, Union Carbide filed a report detailing their findings. The blame was put on a "disgruntled plant employee, who deliberately introduced water into a methyl isocyanate storage tank.” The result was the major release of a cloud of a poisonous gas. There are two sides to every story. If you dig further down, you can find two theories of what/who caused the leak. 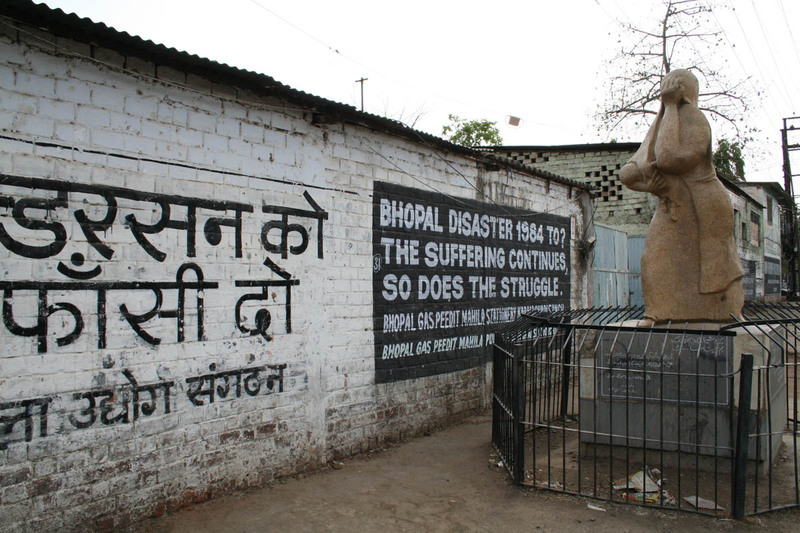 When the plant rose up in 1970, the population of Bhopal was approximately 300,000 (20 years earlier, it was only around 50,000). In the tragic year of 1984, there were about 800,000 people. The Indian government was all for internationalization and eager to establish the chemical industry as a competitive advantage. UCIL was one of the companies supported. They started to manufacture Carbaryl, an insecticide that was sold under the trade name “Sevin.” Safety, however, was not on the top of anyone’s list. The company did not apply the same safety standards at its plant in India as it did at a sister plant in South Charleston, U.S. And, when the owner decided to save money and lower production because the production of pesticides was not a success – numbers–wise as well as health–wise, things only got worse. From 1980 – 1984, around 60 leakage accidents occurred. The plant was losing money. The amount of sales in 1982 was less than half of the production capacity. In 1984, the plant was operating at only about 1/5 of its capacity. Training for employees and the emphasis on the security and safety corresponded with it. The workforce was reduced, they let go of their American engineer and started to train workers as technicians. Shockingly, all the operating manuals at the plant were printed in English, while the workers spoke Hindi. Also, they switched to a more hazardous way of producing pesticides – with MIC (methyl isocyanate, one of the deadliest substances used in the chemical industry) – which is highly reactive with water, unstable, flammable, volatile and toxic. This means that large amounts of dangerous chemicals were stored in tanks. And all the while, pesticide produced there could have been made without MIC. Now we know that everything mentioned above was a big mistake. Or, to rephrase, how did it supposedly go down? Sadly, because of the government’s incompetence/corruption and UCC's lack of cooperation, we'll never know the truth. The world’s worst industrial disaster is also the least investigated one. What we know is that if the workers had been properly trained on the materials used in the system and if the safety rules and maintenance routine had been followed, things would have been different. 1. Routine pipe maintenance caused a backflow of water into an MIC tank, triggering the disaster. The cooling system was not in use that day, temperatures were not logged, the “slip blind” that would have prevented water from passing through the pipes and into the tank was missing, the tank was not pressurized, corrosion was present, the evacuation tank was not empty, the equipment was in poor condition, emergency plans were lacking and we could go on… The plant had four major safety systems (refrigeration; vent gas scrubber; flare tower and water spraying) designed to prevent or neutralize an uncontrolled MIC reaction and, according to workers, three of them were not working that night. From a report written four years after the leakage and from worker testimonies, we can make a rough timeline of the event. 00:15 – they start to spray water from the fire hose. The alarm goes off, but only for several minutes. Testimony from a tea boy from the cafeteria describes the atmosphere as tense and quiet. Operators even refused their tea. They had known something was wrong for at least 30-45 minutes before. Also, UCC knew what a water reaction could cause and they did not take sufficient action (they should have used an incompatible fitting on the hose system to prevent the connection, etc.). 00:30 – values up to 100ºC and 100 psi are mentioned. The pressure gauge supposedly shows 55 psi. This is also the estimated time of the leak, as tank 610 ruptures. Only workers, not the public, are informed through sirens. The leak stops at approximately 02:15. 2. The media and several studies mainly prefer this explanation, but some challenge it; for example, UCC’s intermediary Arthur D. Little Inc. According to their report, if all the valves to the tank had been open, the water pressure would not have been sufficient to climb the 3.1 meters needed to reach tank 610. This report suggests sabotage as the cause of the disaster and it backs up this theory with testimonials from two workers: one saw a hose inserted in the tank and that the tank was missing the pressure indicator, and the second worker overheard MIC operators saying that water had entered through a pressure gauge. The pictures, stories, testimonies and numbers look horrific. It is hard to even imagine. The area that was classified as “affected” was home to around 500,000 people, 200,000 of them children, 3,000 of them pregnant women. MIC has a density approximately twice that of air, causing it hang close to the ground, meaning that children were affected a great deal and as the poisonous gas crept its way through to the densely populated slums, the urban poor died. It also happened in the night, when people were asleep. At least 3,000 people died in the first days – some sources state even bigger numbers. Also, around 4,000 domestic animals and cattle died and vegetation was destroyed, which affected the economic future of the survivors. And we will never know the exact numbers, because registration at hospitals was disorganized, bodies were taken without registration, mass graves and cremations took place, some people fled Bhopal and died elsewhere, immigrants and pilgrims were not accounted for and the media coverage was poor. Also, there were cases where entire families were wiped out, leaving no one to report the casualties. People have also continued to die of the effects over a period of decades. Medical problems are ongoing; for example, rates of cancer are rising, children are born with disorders and men cannot work manually anymore because of lung problems. Nowadays, the factory is a ghost town, abandoned by the owner and authorities, filled with debris, rusting structures and broken parts from the explosion. Piles of industrial waste are degrading in the open. The water and soil is contaminated, by amounts a million times in excess of WHO guidelines. Environmental effects still fill the news. For engineers, HSE professionals and companies, the biggest question was where to go from here. Now that we know what likely caused the tragedy, we can prevent a similar one in the future. Double standards are a no–go. Provide the same degree of safety. Even if your factory is in a poorer country, you should apply first–world standards. However, tragedies like this occur all over the world, for example in Seveso, Italy in 1976, Flixborough, UK in 1974, Chernobyl, Ukraine in 1986 or Lac-Mégantic, Canada in 2013. Our role and purpose is to prevent them and do the best we can when even a minor HSE accident happens. UCC report: Bhopal Methyl Isocyanate Incident. Investigation Team Report. 1985, Union Carbide Corporation: Danbury, CT.